After the shock of leaving The Silent Blue, I felt no immediate desire to be in another band. But after a couple of years, in Summer 1992, a chance meeting in an off-licence in Tunbridge Wells led to me joining Steve, Neal, Mike, and another Graham who were rehearsing together. 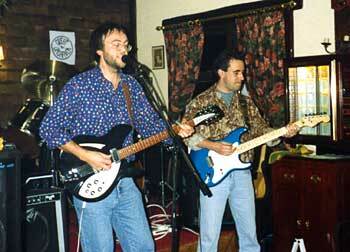 Initially I was solely there as lead singer but after the other Graham left, I became rhythm guitarist as well. We were doing it because it was fun, and we mainly played rock, blues and pop covers, but with a few of my own songs thrown in too. Starting in the autumn of 1992, we used to play gigs at pubs in the North Kent area – anywhere that would have us really and it was nice to actually get paid for a change. Around this time, Sally Day joined on backing vocals. Mike (our first drummer) left us in the spring of 1993 after losing interest, and he was replaced by Martin who was much better, and who had a huge red Noble & Cooley kit that seemed to take up the whole stage. After writing a few more songs, I decided we needed to record them, so starting in early 1994 we booked sporadic sessions at Zero 1 Studios in Oxted (Surrey) to put the best ones on tape. But by the end of 1994 I was getting bored with playing covers, and I wanted to concentrate more on my own material and a new direction. The moment that something becomes a chore is the moment to stop and so I left the band. Follow this link to go to the next page – and read about Shnaffel.